Shame on Ohio, not only for killing an interesting syoty that could have had a great ending, but more for killing an innocent victim who, had known so much freedom and then been chained to a post like a criminal. Just like Missouri the capital of puppy mills, Ohio is right behind us in animal abuse & neglect. Typical of humans! While some love and cherish dogs and other animals, others find nothing wrong in killing them mercilessly and degrading their lives in any manner under the sun. Pam Larsen – The story of Owney is so wonderful and so typical of America – except for his tragic demise. Fred Free should have been arrested and tried for murder, or at least cruelty to animals, along with the hateful man who chained him. Owney could easily have been sedated and gone on to live several more years with the wind in his fur, the delicious scent of his beloved mailbags surrounding him, and the adulation of his public. Rest in peace, Sweet Owney. 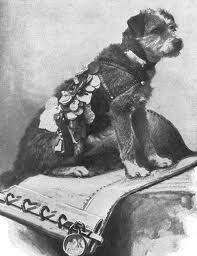 The story of Owney is so wonderful and so typical of America – except for his tragic demise. Owney could easily have been sedated and gone on to live several more years with the wind in his fur, the delicious scent of his beloved mailbags surrounding him, and the adulation of his public. Rest in peace, Sweet Owney. Here is a free link to a wonderful children’s E-book from the Smithsonian Institute. 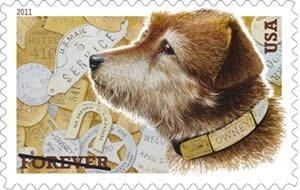 It illustrating the story of Owney and his remarkable accomplishments. I co-wrote the story and the music. Stephen. I had no idea that Owney had his own song. Thanks for keeping the story alive.